CAD Forum - Maze generator for AutoCAD. MAZE is a generalized maze generator written in VisualLISP. This utility was ported to AutoCAD from the original CLISP algorithm published on Github. You can use MAZE to draw any maze structure - a predetermined arrangement of cells (a rectangular grid) with wall sites between them. Each new maze is unique, random. All generated mazes have a free walkthrough path (maze solution). 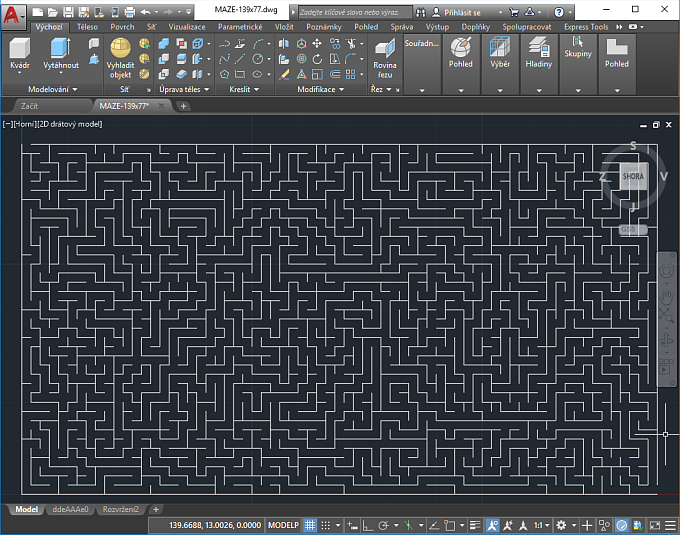 Download the free MAZE.LSP file from www.cadstudio.cz/download, load it into AutoCAD by mouse dragging or with the APPLOAD command and type the MAZE command to draw a randomly generated maze grid. The maze is drawn as LINE entities near the coordinate origin point (0,0). You can change the values of the *width* and *height* LISP variables (in the LSP file) to draw mazes of any size (complexity). Always use odd numbers for these sizes. Sample DWG drawings generated by MAZE are here - MAZE-139x77.DWG and MAZE-47x29.DWG (3D maze, by assigning width and thickness to polylines made from Maze lines). ; The width and height of the maze. Both must be odd! ; Start carving the maze at a specific location. (if (and elem (> (length elem) 1)) ; any segments to draw? ; Create and display the maze. Tip 11502: How to detect DWG files created as an export from Autodesk Revit? Selected tip: How to model a 3D spiral in Inventor? Simple navigation - switching 3D views with your numpad. « | » Simple export of vertex-coordinates from a selected polyline.